Here is the roundup for the final event in the sweet series - Rice and wheat based sweets and diabetic sweets. I really apologise for the delay in posting the roundup. I really appretiate your patience. The sweet series event was a grand success. Hearty thanks for those who sent in their awesome entries for all the events. Here goes the final roundup of the Sweet series. Oh! it was heavenly. I fell in love, the first time I tasted kajoor ka kheer in Turmeric restaurant in Sunnyvale, CA. Since then, I've been planning to try this recipe one day. Mahanandi's post about Sukham Ayu cookbook recipe, Dates Kheer kindled my desire to try this recipe and I thought I can try today, being my birthday, a perfect day to treat myself with this delicious kheer. I tried this in my own style and it turned out to be fantabulous (a new word used by many now a days). What an excellent treat it was! No mess since I tried this recipe in Microwave. The tasty kheer was ready in few minutes. The kheer can be prepared in stovetop or microwave. I am sure it is mess free in stovetop method too. As for me, no kheer is complete without the flavor of cardamom. Here is the recipe. Chop the dates very finely. As the dates are sticky, I used a chopper to finely cut the dates. Pour water in a microwavable safe container and whisk in the almond powder. There should not be any lumps. Microwave on high (open) for approx 5 minutes. Now, add the dates and whisk well. Add in sugar and cardamom and whisk well. Pour one can of evaporated milk. Add more sugar if you think the kheer is not sweet enough. Microwave on high for 3 more minutes and the kheer is ready. Pour water in a kadai and whisk in the almond powder. There should not be any lumps. Keep stirring in medium heat for 5 minutes. You will notice the almond powder is getting cooked in the boiling liquid. Keep stirring in medium heat. You will notice the boiling almond milk bubbling up. Keep stirring continuously. Reduce the heat and give a brisk stir for a minute. Pour one can of evaporated milk or plain milk. Add more sugar if you think the kheer is not sweet enough. Keep in low heat for 3 more minutes and the kheer is ready. Turn off heat. This is my entry to this month's MEC edition for Nuts hosted by me. Many thanks to Srivalli for initiating this MEC event. I am glad to host this event this month. 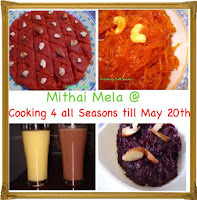 This is my entry to the Mithai mela hosted by Srivalli of Cooking 4 all seasons. Reminder: Please send in your recipes for MEC Nuts. You have time till the end of this month. 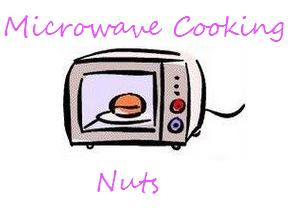 Ample time to create your own dish using nuts in the microwave. Friends, it is a great pleasure hosting events in Paajaka and here I'm proud to host this month's MEC - Nuts. MEC is Microwave easy cooking. The name tells it all. This event focuses only on the recipes that uses ONLY microwave for cooking. This wonderful idea of Microwave cooking event was initiated by Srivalli of Cooking for all seasons. Thank you so much Srivalli. I am glad to host this wonderful event. The theme for this month in MEC is Nuts. Here goes the simple but mandatory rules of participation for this event. 1. Cook any dish starring NUTS (any nut) as the main ingredient in a Microwave and post it on your blog from now till the last date of April, 2009. Note: Posts on Safety, Tips and other things related to to the theme are also most welcome. 3. Multiple recipes are permitted and recipes submitted to other events are also permitted. 4. Recipes from archives can be accepted ONLY if you create a new post and linking to your entries, this post as well as Srivalli's MEC post. 5. Non bloggers are welcome to send in their entries. Just mail me with recipe and picture and I will include in the roundup. 6. Links to this post as well as to Srivalli's MEC post are required. 7. The entire cooking needs to be done in Microwave. Of course, use food processor or others for grinding stuffs, but no stove top please. Only vegetarian entries will be accepted. No egg and no meat please. 8. Send in your entry to mythreyee at paajaka dot com with the following details on or before Apr 30th 2009. Picture (jpg only) of the dish that you are sending. I hope the rules are clear. Please mail me if you have any questions. Let's get started. Let's celebrate Nuts all april. Looking forward to all those delicious entries. The roundup will be posted within a week after last date. 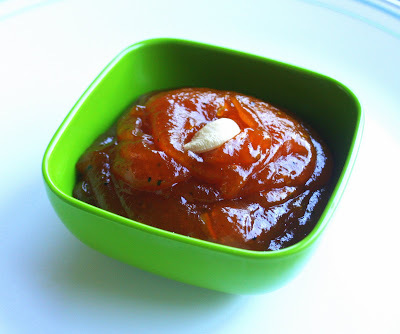 I used kadle bele (otherwise called gram dal or chana dal) to make a quick and tasty chutney. Rice with this chutney and some javarisi vadam is heaven. I sometimes side this rice with curd if the chutney is too spicy. Grated fresh coconut - 2 tablespoons (frozen fresh coconut shredded/sliced can be substituted. Thaw it before use) - increase or decrease the quantity to your taste. Using a teaspoon of oil roast the dal until it is golden brown. Keep stirring as you roast. Once done, reduce the heat and add ginger, curry leaves (if using) and red chillies. Turn off the heat. Allow the content to cool down. When it is cooled down completely, grind the content with coconut, green chilli, tamarind, asafoetida powder, little salt and water. Just enough water to grind. Do not add too much water. Note: use less salt as the final quantity will be very less. Now, heat a teaspoon of oil and pop the mustard seeds. Also add urud dal and wait until it turns golden brown and then pour the seasoning over the chutney and stir. Serve this with white rice. Add a dab of ghee with this chutney rice for extra flavor. This chutney is my entry to three wonderful events chutney/dip mania hosted in mane adige, Lentils mela hosted in Ashwini's spicy cuisine and My legume love affair - eighth helping hosted in The well seasoned cook. Waiting to see all the roundups. Satisfying a sweet tooth is all the more simple when there are sweets that can be perpared in no time. One such sweet is the rava laddu otherwise called sooji laadu or rave unde. Mix few ingredients and the tadaaaa... the sweet is done. Here is how it's made. Grind the rava and sugar together to a fine powder. Note: American granulated sugar crystals are way too smaller than the Indian granulated sugar. In case you are using Indian granulated sugar, grind the sugar and rava separately and mix them together. Reduce or increase the sugar proportion as per your taste. Transfer it to a mixing bowl. Add cardamom powder, saffron strands, ghee roasted cashews and ghee. Mix well. If the mixture is not moist enough to make a ball, add drops of milk. If you do not want to use milk, mix in more ghee. Make small balls out of the mixture and the sweet is ready. A delicious sweet cannot be more simpler than this. This is my all time favorite sweet. Try it and you'll love it. Here is one delicious curry with the star ingredient cauliflower. Cauliflower is one vegetable that can be added to most of the gravies. Goes very well in gravies that has onion/tomato base. 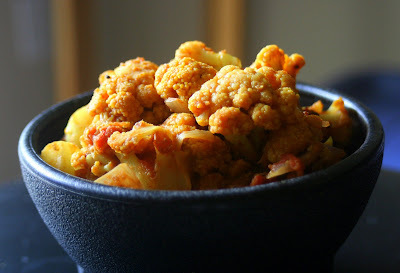 In this curry, the cauliflower is infused with all the basic masala that we use everyday. A very simple dish and goes well with either rice or roti. A perfect spicy dish on a cold winter day. For masala, after roasting the above ingredients, grind it with the following to a smooth paste using very little water. Heat oil in a large kadai. Add mustard seeds. When it pops, add the onions and saute until almost translucent. Add the bay leaf and cinnamon if using them. Add the ground masala and saute it for 2 to 3 minutes. Now add the chopped tomatoes and fry for another 3 to 4 minutes. Add turmeric powder, asafoetida powder and salt. Stir well. Add the cauliflower florets and mix well. Close with a lid and cook until cauliflower is tender. Stir occasionally. Add only half a cup water if you think there is not enough moisture for the cauliflower to get cooked. Garnish with coriander leaves and serve it hot with rice or roti. This is my entry to the JFI - cauliflower hosted by me. Thank you so much Indira for initiating JFI. I am glad I am hosting this event this month. 'Jihva for Ingredients' (JFI) is a monthly event that celebrates an ingredient every month and was initiated by Indira of Mahanandi. I am very happy and honored to host this esteemed event this month here in Paajaka recipes. The ingredient I have chosen is Cauliflower. Everybody loves Cauliflower. It is such a versatile vegetable that can be be roasted, boiled, fried, steamed or eaten raw. When cooking, the outer leaves and thick stalks are removed, leaving only the florets. The leaves are also edible, but are most often discarded. 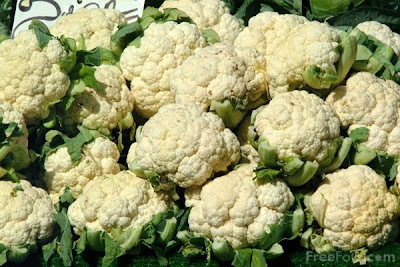 Cauliflowers are included in different vegetable gravies like kurma, gobi mutter etc., few rice delights like biryani, fried rice, pulao etc. and flat breads like gobi paratha. Every cuisine uses cauliflower, for example cauliflower augratin, gobi manchurian and cauliflower kababs to name a few. Let's celebrate Cauliflower. Cook something in which cauliflower is or one of the main ingredients. Send in as many entries as you can. Don't worry about sending the picture, I will get it from your blog. The dish can be from any cuisine. While you send in your entry, don't forget to mention your blog name and name of the dish. the link needs to be a permalink to that recipe and not the link to your homepage. Please include a link to Indira's Mahanandi blog in your post and a link to this event announcement. Please feel free to use the logo. If you are sending from archives, edit the post and include a link to this announcement and Indira's Mahanandhi. The dish should be strictly vegetarian, I mean no eggs or meat. The dish can be appetizer, main course or even dessert. Anything and of course anything that's edible. Please send in your entries to mythreyee at paajaka dot com on or before 1st of March, 2009. Entries from non bloggers welcome. 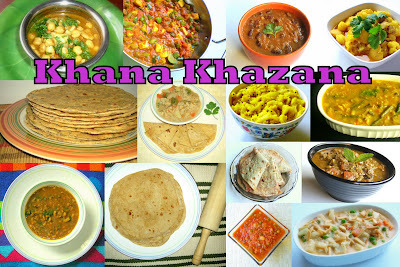 Please email your recipe with picture of the dish and I will post the recipe in my blog mentioning your name. Below are some facts and information that I got from Here, Here and Here. Cauliflower is one of several vegetables in the species Brassica oleracea, in the family Brassicaceae. It is an annual plant that reproduces by seed. Cauliflower lacks the green chlorophyll found in other members of the cruciferous family of vegetables like broccoli, cabbage and kale, because the leaves of the plant shield the florets from the sun as they grow. It has a compact head (called a "curd"), usually about six inches in diameter that is composed of undeveloped flower buds. The flowers are attached to a central stalk. Typically, only the head (the white curd) is eaten while the stalk and surrounding thick, green leaves are used in vegetable broth or discarded. Cauliflower is low in fat, high in dietary fiber, folate, water and vitamin C, possessing a very high nutritional density. As a member of the brassica family, cauliflower shares with broccoli and cabbage several phytochemicals which are beneficial to human health, including sulforaphane, an anti-cancer compound released when cauliflower is chopped or chewed. In addition, the compound indole-3-carbinol, which appears to work as an anti-estrogen, appears to slow or prevent the growth of tumors of the breast and prostate. Cauliflower also contains other glucosinolates besides sulfurophane, substances which may improve the liver's ability to detoxify carcinogenic substances. A high intake of cauliflower has been found to reduce the risk of aggressive prostate cancer. Cauliflower and other cruciferous vegetables, such as broccoli, cabbage, and kale, contain compounds that may help prevent cancer. These compounds appear to stop enzymes from activating cancer-causing agents in the body, and they increase the activity of enzymes that disable and eliminate carcinogens. Cooking cauliflower in an aluminum pot will intensify its odor and turn its creamy white anthoxanthin pigments yellow; iron pots will turn anthoxanthins blue green or brown. Like red and blue anthocyanin pigments (see BEETS, BLACKBERRIES, BLUEBERRIES), anthoxanthins hold their color best in acids. To keep cauliflower white, add a tablespoon of lemon juice, lime juice, vinegar, or milk to the cooking water. Steaming or stir-frying cauliflower preserves the vitamin C that would be lost if the vegetable were cooked for a long time or in a lot of water. So, let's get started. Cook something with one or combination white/purple/orange/green cauliflower and send in your entries. If you have any questions, please mail me or leave a comment. Thank you. Wish you all a very happy new year 2009. This is my first post this year and I wanted to make a SWEET start. I learnt this recipe from my FIL's brother Ramani chikappa, who is fond of trying new recipes especially sweets. There is a huge banganaballi mango tree in my inlaw's place and chikappa prepared this delightful MANGO HALWA using homegrown fresh ripe mangoes and cooked in stovetop. The three main ingredients in this recipe are mango, sugar and ghee and of course some cardamom for flavor. Instead of using the fresh ripe mangoes, I used store bought sweetened canned mango pulp. Since it was already sweetened, I had to use less sugar. Also, instead of stove top cooking, I preferred microwave cooking, since it is mess free and no need to bother about over heating or constant stirring. I have tried corn flour halwa and badam halwa in microwave and I was pretty confident that this halwa too will turn out to be good. The result was no dissappointment. The halwa was smooth, shiny, 100% mango taste and all in all, a divine treat and is a perfect sweet for any occasion. 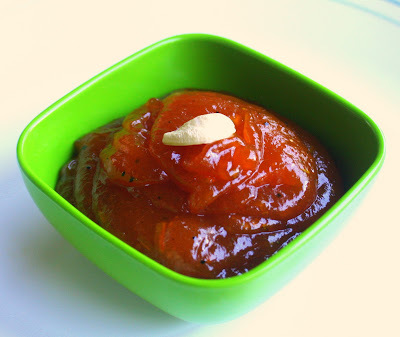 I have used saffron too in this recipe, may be that's why, the color of the halwa is orangish. Here is the recipe. In a wide bottomed microwave safe high heat resistant large (corning ware or pyrex glass ware preferably) container add one can of mango pulp. Microwave on high for 5 minutes. Add sugar and stir well until even distribution and again microwave high for 5 minutes. Stir in cardamom powder and saffron strands. Stir the content and cook for 20 minutes, stirring once every 5 minutes. Add ghee and stir in until even distribution. Adding more ghee is optional. Microwave on high for 8 to 10 minutes and do not forget to give it a stir every 4 or 5 minutes. After the halwa consistency is reached, give a quick stir and allow a standing time of about 5 minutes before tasting the halwa. If you think the halwa consistency is not reached, microwave again for 4 to 5 minutes. Scoop a dollop of this halwa and garnish with a single cashewnut before serving.